If you work from home, you know how difficult it can be to find a space in your home to get work done. Ideal Office Solutions has worked with countless self-employed or work-from-home employees to create a space that is both visually appealing and allows for productivity. Through our experience, we have acquired some best practices to share with future clients. 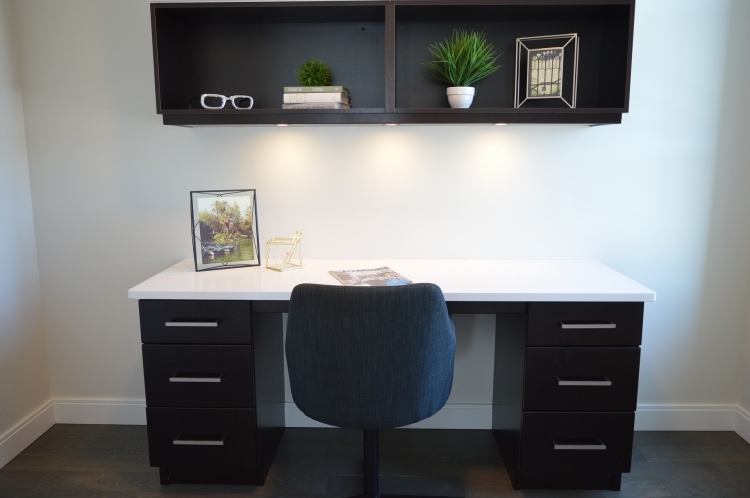 If you are looking to transform a space in your home into an office, consider our suggestions on how to make the most of your space! It is essential to choose a place in your home that will be conducive to a work environment. Anyone who has worked from home knows how easy it is to get side-tracked from the various distractions in your home so don’t make it any harder! If possible, choose a space away from particularly noisy or busy areas with lots of foot traffic if others are home during the day. Since you will be spending a lot of time here, try to choose a room with a window to have fresh air and natural sunlight accessible. Picking out the perfect office furniture can be a hassle so it is tempting to use the same old desk and chair you’ve had for decades. You will be spending a majority of your time in this room so it is well worth the investment for a new desk and chair at the least. A comfortable chair can make a difference in your productivity so be sure to take your time picking out the perfect fit. If you have visitors even semi-often, make sure you have alternative seating so guests aren’t waiting for you to bring in a chair from elsewhere. One of the great things about working from home is the autonomy you have over your work space. Take advantage of this by personalizing your workspace to your style preferences. Depending on your budget, prioritize the things that matter the most to you. You can paint the room a color of your choosing, invest in a standing desk to change the way you work, or hang photos and other decorations to spruce up your wall space. At Ideal Office Solutions, we have experienced staff to not only help you choose the perfect furniture for your home office but to help design your room to promote productivity while customizing it to your liking. Contact us today and get started on the home office of your dreams!